From Goodreads ~ Homeless, alcoholic and depressed, Michael King lives in a UPS loading bay on the wrong side of the tracks in Portland, Oregon. One rainy night, he stumbles upon a hurt, starving, scruffy cat and takes her in. Nursing her back to health, he names her Tabor and she becomes a bit of a celebrity in southeast Portland. When winter comes, they travel from Oregon to the beaches of California to the high plains of Montana, surviving blizzards and bears, angry steers and rainstorms. 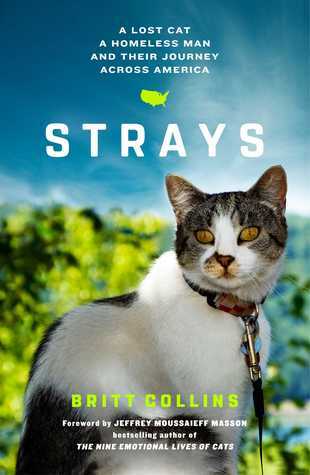 Along the way, people are drawn to the spirited, beautiful cat and moved to help Michael, who cuts a striking figure with Tabor riding high on his backpack or walking on a leash. Tabor comforts Michael when he’s down, giving Michael someone to love and care for, and inspiring him to get sober and to come to terms with his past family traumas and grief over the death of his life partner. I love reading stories about animals so that's why this one caught my eye ... I couldn't resist the picture of the kitty on the cover! Mata and Creto were kitty siblings living with their owner, Ron, in Portland. Mata disappeared one day and Ron and Creto were devastated when she didn't return. Creto became depressed and Ron never gave up hope that Mata would come back home. Michael was homeless and an alcoholic and running from his past. When he found a hurt starving cat, he took care of her but hoped she would find her way home and posted finding her in various online sites. But she never left and no one claimed her so Michael kept taking care of her and named her Tabor. Michael's friends came to love her and she became part of their circle. When winter came, it was time to head south to warmer temperatures so Michael and Tabor hitchhiked to California and then to Montana to visit with Michael's foster father, Walt. At Walt's suggestion, Michael took Tabor to see a vet to get checked out and it was there that they found she had a chip and an owner back in Portland. Michael was heartbroken but knew the right thing to do is to return the cat back to her rightful owner. They spent their last time together hitchhiking back to Portland. Though this is a true story, I hadn't heard about it before I read the book. The author had read about it as it was happening and then contacted Michael, Ron and others to write the book and tell the story. I liked this book. Not only because it was about a kitty but it also gave me some insights into what it's like being homeless. I found Michael and Tabor's story more interesting and compelling than Ron's. Michael had his demons and taking care of Tabor gave him someone/thing else to think about. Mata had gotten lost in the past so I didn't understand why Ron allowed her to roam freely around again. He should have never let her outside again without being on a leash or supervised (same goes for his other cats). 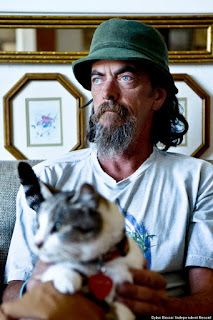 While I applaud Ron for being caring and taking in homeless kitties, I think he needs to be more responsible and realistic about the ones he has. Despite being homeless, I think Michael took better care of her. I feel the same way about this story. Everyone are enamored with Tabor. I somehow, feel that it is incredibly sad that Michael had to give her up and give her back to Ron. I felt that Ron could have let Michael see her or visit with her once a while. In the mean time, many people are protective and processive with their animals and would not want to share them. I hope they do a follow up story about Michael.